Afton Mountain looking northwest at Shenandoah Valley. 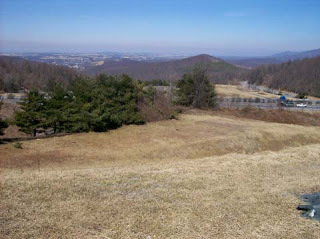 Afton Mountain. 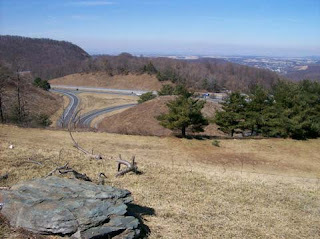 The crossroads of I-64 and the end of the Skyline Drive/ beginning of the Blue Ridge Parkway. 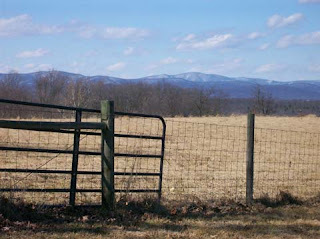 It's the gateway to the Shenandoah Valley ... a fantastic vista into the Valley where you're going ... and the Rockfish Valley where you came from. It's the meeting of boundary lines for Augusta, Albemarle, and Nelson Counties. Today was just about perfect: sunny, mild 50-something temperatures, and no wind. 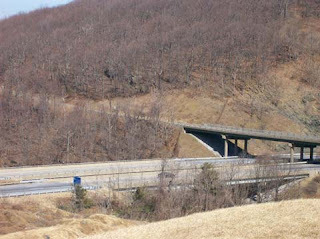 Afton Mountain where Skyline Drive crosses I-64. Howardsville Turnpike with remnants of snow. So ... a couple of friends and I headed to the hills. 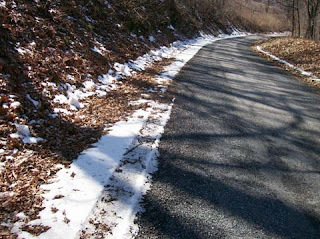 Our destination was Humpback Rock but the Blue Ridge Parkway was closed due to the recent ice and snow storms, and there's much tree damage in that area. 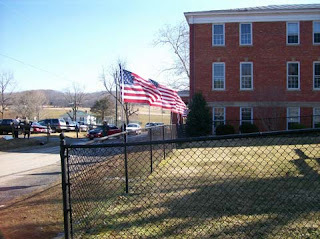 We walked the Drive for a bit, and then headed across the Valley to the western side of Augusta County and Augusta Springs. 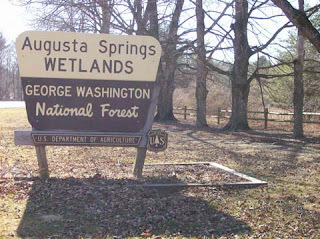 Augusta Springs is a protected wetlands, an area with familiar trails that didn't go up into the snowy area of the mountain. With the run-off from Sunday's snow, it was plenty wet today! There was rushing water coming off the mountain and spilling over into the natural spring and rushing down the spill-way to the pond. It smelled "outdoorsy" ... the clean air smelled so good. It felt wonderful to be outside. The mountains called me today ... and I answered. I tried to post this morning to no avail. First, Blogger wouldn't let me sign into my account. Some hours later, when it finally let me sign in and write up a post, it ate it. Voila! It all disappeared and I was kicked off-line. Since I was gone the rest of the day, and with a meeting to head out to tonight, I'm going to try to post something before leaving. 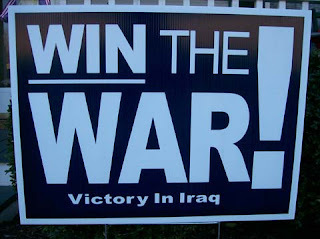 We have reordered Win the War signs since we're completely out of the first batch. With a waiting list of folks who want signs for their yards, we should go through them quickly. If you're interested send a comment with your email (I moderate my comments so it won't be publicized) and I will get back with you. I received a request today from the Fauquier County Republicans for signs so they are being distributed throughout the state. Candle in the window: Please join us in displaying a white electric candle in the window to show support for the troops. Late Saturday night I drove past a nearby home ... there were candles in every window, upstairs and down ... and it made me catch my breath. I know those folks ... their son is a VMI graduate and is in the Army. She told me she was putting a candle in the window ... but 12 candles all across the front of the house stirred my heart. Support the Troops Rally ... "A Gathering of Eagles": Saturday, March 17, 2007, at 12:00 Noon in downtown Staunton at the corner of Johnson and Augusta Streets. You are welcome to bring an American flag or Support the Troops sign. "Just why in the hell do I have to press '1' for English?" Should English be the official language of America? Just think ... without an official language, government could be required to have all publications and documents available in every language. With 322 languages spoken in the United States, that could be an avalanche of paper -- marriage licenses ... vehicle registrations ... disaster instructions ... IRS filing papers ... voting ballots. The Democrat mayor of Nashville recently vetoed a bill that would have made English the official language of that city, saying it was "unconstitutional, unnecessary, and mean-spirited." The Democrat Senate Majority Leader Harry Reid has declared any law to make English the official language "racist." 77% of Hispanics say English should be official language. U.S. English reports many facts and advantages that support making English the official language. 28 states including Virginia (1996) have English as their official language. Ninety-two percent of the world's countries have at least one official language. English is the sole official language in 31 nations. An additional 20 nations recognize English as one of two or more official languages. California leads the nation in the number of limited English proficient persons, with 6.3 million, or one-fifth of the population of the Golden State. Texas is second with 2.7 million, followed by New York, Florida and Illinois. New Jersey, Arizona, Massachusetts, Georgia and Pennsylvania round out the top 10. Since 1980, the number of U.S. residents who are limited English proficient has more than doubled, from 10.2 million to 21.3 million. In 1980, fewer than 1-in-20 Americans struggled with English. Now, nearly 1-in-12 do. In 2000, 11.9 million U.S. residents lived in linguistically isolated households, meaning that no one in the household spoke English at home or spoke English "very well". This figure is up 54 percent from 7.7 million in 1990. In all, more than 1-in-25 households in the United States is linguistically isolated. California has the most languages spoken at home of any state with 207. New York is second with 169, followed by Washington, Texas and Oregon. Pennsylvania, Florida, Illinois, New Jersey and Arizona round out the top 10 states. English proficiency rates among immigrants vary widely by ancestry. More than 80 percent of the immigrants from several ancestry groups speak English "very well," including Egyptians (90.4 percent), Lebanese (89.5), Pakistanis (87.7), Romanians (86.5), Iranians (86.1), Thais (83.0) and Argentineans (81.6). Other ancestry groups lag far behind the overall average of 71.4 percent English proficient, including Cambodians (65.7), Vietnamese (64.4), Hondurans (53.5), Guatemalans (52.8) and Mexicans (49.9). In 1999, the average employed immigrant who spoke English very well earned $40,741, more than double the $16,345 earned by immigrants who did not speak English at all. The increasing scale of English proficiency and earnings was recorded at every education level from less than high school through master's degree and beyond. The ability to understand English was so crucial to immigrant success that foreign-born workers with moderate-to-high levels English proficiency had higher earnings than native-born workers with the same degree of English proficiency. More important, data from the National Adult Literacy Survey found that immigrants with a low degree of English proficiency earned one-half of what those with a medium degree of proficiency earned and less than one-third of highly English proficient immigrants. Immigrants who speak English "not well" or "not at all" have median weekly earnings approximately 57 percent of those of U.S. born workers. The weekly earnings of immigrants who speak another language at home, but speak English "very well" or "well" are nearly 90 percent of those of U.S. born workers. Immigrants who speak English at home are best off, with median weekly earnings 20 percent higher than U.S. born workers. The U.S. Department of Education found that those with limited English proficiency are less likely to be employed, less likely to be employed continuously, tend to work in the least desirable sectors and earn less than those who speak English. Annual earnings by non-English proficient adults were approximately half of the total population surveyed. The Tomas Rivera Policy Institute found that, "far and away, the most commonly cited obstacle to gaining college knowledge was the language barrier." While 96 percent of the Latino parents surveyed in the nation's three largest cities expected their children to go to college, nearly two-thirds missed at least half of the questions on a "mini-test of college knowledge." Effective English language instruction is an essential antipoverty tool for working immigrant families. Poverty and the need for public benefits, such as food stamps, are more closely related to limited English proficiency than with citizenship or legal status. The Canadian Government spends $260 million annually to do government business in both of the nation's official languages. This figure was 0.16% of the Canadian federal budget. If the U.S. was to spend 0.16% of the federal budget to do government business in two languages, the cost would be $3.8 billion. The Canadian Government spends $24 per Canadian resident per year to do government business in both of the nation's official languages. If the U.S. was to spend $24 per person per year on government multilingualism, the cost would be $5.7 billion. There are 25 nations and 20 official languages in the European Union, yielding 380 translation combinations. In June 2004, facing a backlog of 60,000 pages awaiting translation, European Union officials were asked to limit their documents to 15 pages to avoid further burdening the system. The average document size prior to this request was 32 pages. There are 1,800 translators, representing eight percent of the entire staff, at the European Commission. In 2004, the cost of translation and interpretation at the European Commission was $720 million. It is estimated that by 2007, the cost will have risen to $1.06 billion. The cost of multilingual ballots and translations represented one-eighth of Los Angeles County's $16 million expense in the Nov. 2004 general election. The City of San Francisco must spend $350,000 for each language that a document is translated into under the city's bilingual government ordinance. The total annual cost for the California Department of Motor Vehicles (DMV) to provide language services is $2.2 million. Of the 3,600 Chinese ballots prepared for the Sept. 2002 primary election in King County, Wash., only 24 (or 0.67 percent) were used. The total cost of providing multilingual services for the Immigration and Naturalization Service would be between $114 million and $150 million annually. It costs $1.86 million annually to prepare written translations for food stamp recipients nationwide. The cost for oral translations skyrocket to $21 million nationally per year. 79 percent of Americans, and 81 percent of first and second generation Americans favor making English the official language of the United States. Majority support for official English was recorded among every subgroup, including age, gender, race, and political affiliation. A 2001 Gallup poll found that 96 percent of Americans believe that it is essential/ important that immigrants living in the United States learn to speak English. 85 percent of Americans believe it is very hard or somewhat hard for immigrants to get a good job or do well in this country without learning English. Nearly two-in-three foreign born adults say that the United States should expect all immigrants to learn English. 68 percent of Hispanics say that the goal of bilingual education programs should be to make sure that students learn English well. Three-in-four foreign born adults believe that schools should teach English to immigrant students as quickly as possible, even if it means that they need to catch up in other subjects. Nearly 90 percent of Latinos believe that adult Latino immigrants need to learn English in order to succeed in the United States. 86 percent of Americans call the ability to speak and understand English an absolutely essential or very important obligation for all Americans. We are the United States of America. Should English be our official language? Kilo Sparks Up Virginia Blog Carnival!!! Kilo has this week's Virginia Blog Carnival at Spark It Up!!! Great job ... and thanks, Carl. So where does George Allen go to get his reputation back? So the mainstream media did it again ... but we all knew that, didn't we? During the fall senatorial campaign the MSM did everything in its power to strip George Allen of his Senate seat and put in temper-tantrum Jim Webb. Now comes word that -- oops! -- the Associated Press made a mistake. A month before last year's election, in which Allen was narrowly unseated by Jim Webb, The Associated Press reported that Allen had failed to disclose stock optoins he earned while serving as a director of Commonwealth Biotechnologies Inc. The AP also hinted at wrongdoing because the Richmond-based company had done business with the state while Allen was governor. He served on the company's board between his departure as governor and his election to the Senate. The charges were used by the Webb campaign and mentioned in scores of subsequent news stories and broadcast reports. The implication was clear: George Allen, macaca man and stock-option cheat. Last week it was disclosed, by the AP, that a bipartisan Senate Ethics Committee had cleared Senator Allen. He was not required to report the options. "Kudos to the AP for correcting its earlier story. It comes a little late, though." No wonder Rush Limbaugh calls it the drive-by media. 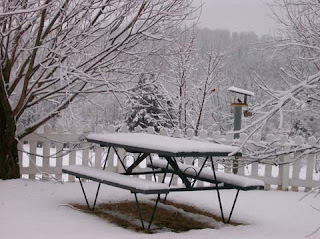 The latest winter storm in the Shenandoah Valley started around midnight as sleet mixed with snow, quickly covering the deck in a glistening wintry mix. 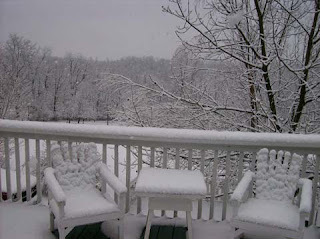 By morning everything was covered in a blanket of white with heavy snow falling. 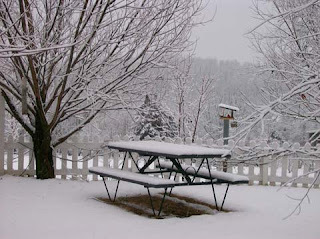 Already we have 4" on the ground and the forecast calls for it to continue all day. With a fire roaring in the woodstove, it's time to put on the chili pot, heat up the hot chocolate, and get ready for a day of sledding. Kilo at Spark It Up!!! wrote Laid To Rest. He offered supportive, encouraging remarks about the SWAC bloggers and our support of the military and the war. Thank you, Kilo, from all of us for your kind words. SWAC Girl remembers a hero's funeral in A community honors a local fallen hero. May God bless Daniel Morris and his family ... and may God bless America. Hundreds of mourners packed the historic New Providence Presbyterian Church Thursday for the funeral of Lance Cpl Daniel Morris who was killed in Iraq on Valentine's Day. Forty-five minutes before the 11:00 service was to begin, cars were backed up on Rt. 252 waiting to turn into the parking area; others parked along the road. The standing-room only crowd included 50 high school students, the Wilson High School Marching Band, friends, family, community leaders, active military, Marine League, military veterans, and law enforcement officers. SWACers who attended included Captain Barth Berry and his wife, Kimberly and their two children; SSgt. Herb Harman and his wife, Jan; Marine Reservist Jim Holbert; Marine Reservist Scott Anchors; Poppet Nelson, Rhonda & Scott Winfield; Alex Davis, SWAC Daughter, SWAC Husband, and SWAC Girl aka Lynn R. Mitchell. 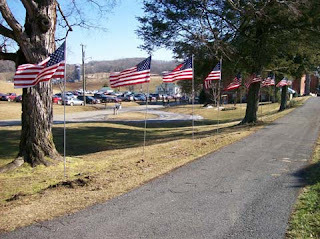 The Augusta County Republicans, after asking permission of the family, had arrived early to put up dozens of American flags to honor Daniel and his family. 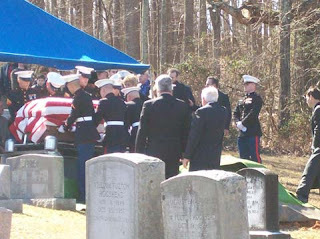 When the service ended, eight Marines carried the casket from the church followed by Reverend Christopher Crotwell, the family, and all those in attendance. Standing guard outside were a dozen members of the Patriot Guard Riders, each holding an American flag, each standing solemnly to honor a young Marine and fellow American. A bagpipe played the Marine Corps Hymn and "Amazing Grace" as mourners slowly followed the flag-draped casket out the door and along the drive to the adjoining cemetery, gathering at the top of the hill at the final resting place for Daniel. Co. C 4th Combat Engineer Battalion. 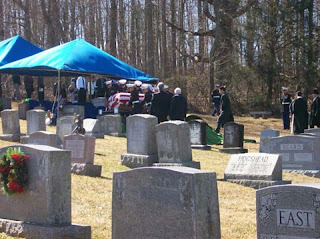 As a gusty breeze blew through the trees on an unusually mild February afternoon, the graveside service included Taps, a 21-gun salute, and the presentation of the Purple Heart to the family. Fifteen Marines and a Navy bugler carried out the final details of the ceremony. How does one thank a family for such a supreme sacrifice? What words can be said ... what actions can be taken? How can we honor a young man who was willing to lay down his life for us ... for me ... for my children? Many emotions play out ... many tears are shed. I did not know Daniel ... but he was the age of my youngest child. He was a fellow Marine to 21-year-old Nate Salatin, the young man from Augusta County who is currently serving in Iraq who is special in my life. To decide at such a young age to serve one's country shows a maturity way beyond that of many others their age. I posted a photo of a whiteboard with the comment: "America is not at war. The Marine Corps is at war. America is at the mall." While other 19-year-olds (and all the rest of us) are hanging out at the mall or spending our days playing video games or other numerous activities, our volunteer military is out there protecting us, standing guard over us, giving us the freedom to live life as if we are not at war. We must never forget those who have paid the ultimate sacrifice. The very least we can do is support our Armed Forces and their mission and our country ... and our President. Being a Monday-morning quarterback is always easy; being a leader is not. And leadership includes keeping the people of America safe from terrorists who want to kill us. Daniel was part of that war on terrorism. He knew when he joined the Corps he could be sent to Iraq. That is bravery. At his young age he wanted to go so that a husband or father wouldn't have to go ... he was ready to serve. And he was ready to die. God bless Daniel Morris and his family. We thank them for their sacrifice for our freedom. Also stories at Staunton News Leader and Waynesboro News-Virginian. John Palmer Gregg's photo gallery. Letter to Editor in News Leader: Daniel Morris stands guard at the Pearly Gates. 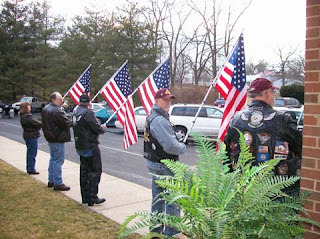 Patriot Guard Riders stand watch at funeral home. 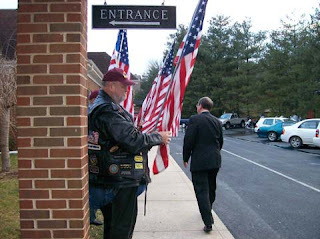 Congressman Bob Goodlatte thanks Patriot Guard. 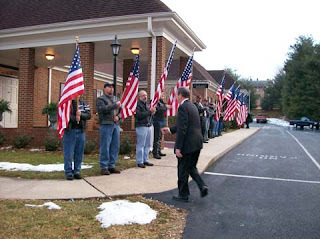 Congressman Bob Goodlatte with Patriot Guard. What an amazing family Daniel Morris belonged to. What an amazing turnout from the community tonight to honor this young man and his family. We spent two hours at the funeral home, waiting in line, visiting, watching as friends, relatives, and the community came together to wrap their arms around this young man's family ... and his family was very, very appreciative of everything. There were flowers everywhere including those from Augusta County and Staunton Republicans, and photos and mementos ... a reminder of the young life that had ended too soon ... and a glimpse of how he had grown to become the fine young man he was. We arrived at 5:15 and the line was out the door ... visitors waiting to pay their respects ... high school students, retired folks, law enforcement officers, co-workers, neighbors. Local Republicans seen were Chris Green, Alex Davis, Rhonda Winfield, SWAC Daughter, Kurt Michael, and SWAC Girl. The first sight when turning into the parking lot was the 12 Patriot Guard Riders standing guard at the door to the funeral home holding American flags. What a stirring sight ... how appropriate. I spoke with them, thanking them for what they do. I talked at length with Jim from Roanoke who told me they were there with permission of the family to honor Daniel, and to be a barrier if there were hecklers or anti-war protesters which they were not expecting in this area. They had come from throughout the state and locally. Congressman Bob Goodlatte arrived around 5:30 to pay his respects to the family, staying a good while and visiting with the family. He had been in the District all day and had driven from Lynchburg, determined to get to Staunton in time. Before entering the building he shook hands with each Patriot Guard Rider and thanked them for being there. Daniel's mom, Carol, was gracious to all who went through the line that included many relatives -- grandparents, aunts, uncles, cousins. When I got to her I told her my name and that I was with the Augusta County Republicans ... and that we were sorry for their loss and grateful for their sacrifice and they were in our prayers. I shook hands with each Marine guarding the body and thanked them for their service and told them what they heard in the press was not the whole story ... that many Americans especially in this community were behind them. What an emotional evening. It centered me to one more be appreciative of what we have in this country ... and how much we owe to our Armed Forces. The funeral is tomorrow in Raphine at 11:00 a.m. at New Providence Presbyterian Church. The Patriot Guard Riders will be there standing guard ... the Wilson High School Band will be there in uniform (Daniel played trumpet in the marching band) ... the Marine League will be there ... many in the community will attend. Directions to the church are below. 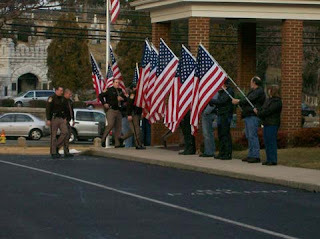 Patriot Guard Riders ever faithful. I received an email with the song, "If I Die Before You Wake," from Augusta County resident Mike Winfield whose nephew, Lance Cpl. Jason Redifer, was killed in Iraq January 31, 2005, at the age of 19. I don't know the writer or who sings it but it's accompanied with only an accoustic guitar and is a plaintive, heartfelt song. The simplicity of the music and the words touched me. We've lost three young men from Augusta County, all Marines, all Lance Corporals, all 19 years of age, and all three outgoing and active in the community and sorely missed by family and friends. Here is "If I Die Before You Wake" dedicated to Lance Cpl. Jason Redifer killed in Operation Iraqi Freedom on January 31, 2005, Lance Cpl. Daniel Bubb killed in Operation Iraqi Freedom on October 17, 2005, and Lance Cpl. Daniel Morris killed in Operation Iraqi Freedom on February 14, 2007. No, it ain't too high a price to pay ... if I die before you wake. I received a comment from Kathi on my post about Lance Cpl. Daniel Morris who was killed in Iraq February 14 saying she would be with the Patriot Guard Riders at the funeral. If you don't know anything about these heroes please check out Patriot Guard Riders. Many, if not most, are military veterans, and the honor they pay our fallen war heroes is amazing. Here is what Kathi wrote at her site. 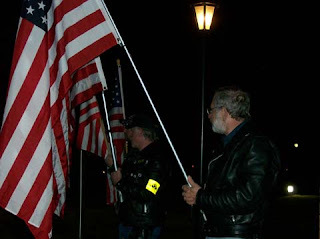 God bless the Patriot Guard Riders. The boyfriend and I will be attending a Patriot Guard Riders mission tomorrow for a fallen Marine from our area, Lance Cpl. Daniel T. Morris. Lance Cpl. Daniel T. Morris, 19, of Crimora, Va., died Feb. 14 while conducting combat operations in Al Anbar province, Iraq. Morris was assigned to 2nd Battalion, 3rd Marine Regiment, 3rd Marine Division, III Marine Expeditionary Force, Kaneohe Bay, Hawaii. This death hits close to home. A coworker of mine had grandchildren who attended school with this Marine. Rest in peace, Lance Cpl. Daniel T. Morris. Prayers are going up for your family and friends, and we will stand with many others to honor you tomorrow. The Staunton native had made 40 previous dives into an underwater cave along Florida's Suwannee River. But this time the Robert E. Lee High School and University of Virginia graduate didn't come out alive. Ronald Wayne Simmons, 53, had gone diving February 14 in an area he was very familiar with ... an area of caves that he had mapped and surveyed in the past. After he was reported missing by a friend, rescuers found his body 300 feet from the cave's entrance. It appeared his equipment had malfunctioned. He was described as a nature enthusiast and outdoorsman who had many friends in Florida's caving and cave-diving communities. He was known as a great mapper and hard-core explorer who had cave-dived all over the world. His funeral will be Friday in Staunton. Obituary may be found here. The body of Lance Cpl. Daniel T. Morris, 19, who was killed in Iraq on Valentine's Day, arrived home to Augusta County yesterday. The Waynesboro News-Virginian has coverage including a photo of the Marines carrying the body into the funeral home as the family looks on in A sad homecoming. Previous stories can be found here and here. Daniel Morris' obituary can be found here. Visitation will be today at Henry Funeral Home on W. Beverley Street in Staunton from 5-8 p.m. Daniel's funeral will take place tomorrow at 11:00 a.m. at New Providence Presbyterian Church in Raphine. Delegate Ben Cline (R-24), who represents the southern part of Augusta County, moved that the House of Delegates adjourn in the memory of Lance Cpl. Daniel Morris' memory on Monday. Daniel, a 19-year-old Marine from southern Augusta County, was killed in Iraq on Valentine's Day. Daniel will be buried on Thursday at New Providence Presbyterian Church in Raphine. On that day, the House of Delegates will consider the memoralizing resolution for him, HJ 1007 (Landes, Saxman, Cline). Today many local SWACers volunteered to hold American flags while the body of Daniel Morris arrived at Henry Funeral Home in Staunton. However, those transporting the body did not call from the road but, instead, after they arrived. It was the thought, the willingness of so many, that was so touching about the entire thing. Many were rearranging schedules with children, school, work to be on call to stand on the street with an American flag to honor this young man. The Shenandoah Valley is full of amazing people who support the troops and show it by all they do ... and they support the families of our Armed Forces. God bless Daniel Morris and his family. "The first born of the first born of the first born." from the educational path we helped build together. Thank you for continuing to build upon it. quiet but always thinking of others. With a heart of gold ... you're a special person. Lance Cpl. 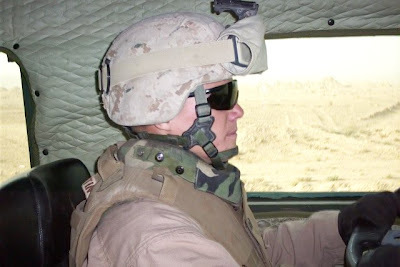 Daniel Todd Morris, United States Marine Corps, 19, of Raphine, fell out of harm's way and into the eternal peace of God's protection on Wednesday, Feb. 14, 2007, in the Al Anbar Province of Iraq. He was born Sept. 22, 1987, in Colorado Springs, Colo., a son of Carol (Wood) Morris Wendell. Daniel was a rifleman with the 2nd Battalion, 3rd Regiment and had been stationed in Kaneohe Bay, Hawaii. He is the recipient of the National Defense Medal, Global War on Terrorism Service Medal, Iraq Campaign Medal and the Sea Service Deployment Ribbon. To honor his bravery and sacrifice, he has been awarded the Purple Heart. He was a 2005 graduate of Wilson Memorial High School where he played trumpet in the marching band. He enjoyed video games, Seinfeld episodes and working with computers. Before entering the military, Daniel worked at McDonald's in the Staunton Wal-Mart and in Community Development at Augusta County Government Center. Family members include his mother and her fiancé, Donnie Moneymaker and his family; mtaernal grandparents, Charles D. Wood of Huttonsville, W.Va., and Johnny C. Wood of Stuarts Draft; paternal grandparents, Billy Morris Sr. and Barbara Hayes, both of Crimora; maternal great-grandmother, Dessie Stemple of Clarksburg, W.Va.; his brother, Jonathan C. Morris of the home; an uncle, Kevin Wood and his friend, Elaine Morris of Huttonsville; a nephew, Kevin Wood and a niece, Krista Wood, both of Stuarts Draft; many loving great-aunts, uncles and cousins; a special great-aunt, Murhl Blessing and her husband, Lew, of Lyndhurst; a special cousin, Rhonda Shifflett and her husband, Tony, of Fishersville; and special friends, Jeanette Cash of Fishersville and Cory McDaniel of Waynesboro. He was loved by the employees of Woodrow Wilson Rehabilitation Center and Augusta County Government Center. A funeral service will be conducted at 11 a.m. Thursday, Feb. 22, 2007, in the New Providence Presbyterian Church by the Rev. Christopher Crotwell. Burial will follow in the church cemetery with military graveside rites by members of the U.S. Marine Corps Co. C, 4th Combat Engineer Battalion, who will also serve as active pallbearers. Honorary pallbearers will be Lew Blessing, Bob Wimer, Tony Shifflett, Kevin Wood, Denny Morris, Cory McDaniel, Wayne Reese and Jerry Moneymaker. The family will receive friends from 5 until 8 p.m. Wednesday, Feb. 21, 2007, in the Henry Funeral Home. In lieu of flowers, memorial contributions may be made to the John Morris College Fund, Community Bank, 38 N. Central Ave., Staunton, VA 24401. Condolences may be sent to the family online at http://www.henryfuneralhome.net/. - Freedom Isn't Free ... Augusta County Marine Killed (2-15-07). 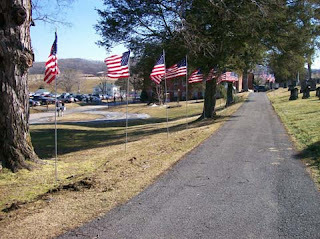 Update 2-14-10: Freedom is not free ... remembering a fallen hero. All gave some ... some gave all. "America is not at war ... America is at the mall." This is one of my favorite photos of my President. had been attacked by Muslim terrorists. to keep us safe the past five years. It's Mardi Gras! Virginia Blog Carnival is on parade! Ward at The Ward View has done an outstanding job pulling together dozens of posts to put up this week's Virginia Blog Carnival. It's a party ... Carnival on parade! Thanks, Ward! "… An eagle knows when a storm is approaching long before it breaks. The eagle will fly to some high spot and wait for the winds to come. When the storm hits, it sets its wings so that the wind will pick it up and lift it above the storm. While the storm rages below, the eagle is soaring above it." There are plans around the country to counter the anti-war protesters who will be out on Saturday, March 17, 2007, to protest the 4th anniversary of the U.S.A.'s entry into Iraq, Operation Iraqi Freedom, in the continuing war on terrorism. Here in Staunton we plan to be out that day to defend our home turf. Much as I would love to be in D.C. with all those veterans defending the Vietnam Wall from the anti-war, anti-America crowd, I feel the need to organize and participate in the local event. Please come out and show public support even if it's only for 30 minutes. This is your opportunity to show the world there is a Silent Majority that is not being represented by the mainstream media, that is not being heard by the Democrats, that is not being heard by terrorists around the world. 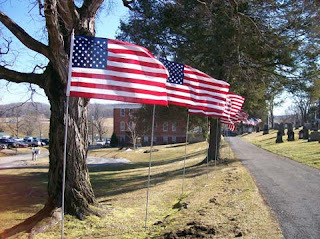 Please plan to join us in downtown Staunton on Saturday, March 17, 2007, at 12:00 Noon. If you have one bring an American flag and/or a Support the Troops sign to show that we support the troops, the mission, and the President. Bring your WIN THE WAR signs! We will meet at the Augusta County Courthouse on the corner of Johnson and Augusta Streets. Free parking will be available in the Wharf parking lot (diagonally across street from Courthouse), the Johnson Street parking garage (one-and-a-half blocks from Courthouse), or New Street parking garage (one block from Courthouse; minimal fee to park). The national gathering in D.C. is called the "Gathering of Eagles." We will have a small town version of that. Here is the notice about the national event. Leftist activists who march to the Pentagon next month will discover that their path won't be as clear as it has been in the past. The group, led by Cindy Sheehan, Jane Fonda, Ed Asner and their ilk, plan to gather March 17 at the Vietnam Memorial Wall to begin a march to protest America's involvement in the Iraq war. The date marks the fourth anniversary of the war's beginning. This time, however, protestors will see objectors if they spit on Iraqi veterans again, or throw paint on a war memorial. This time, they will encounter a buzz saw of Vietnam veterans and supporters who will gather to protect the Wall, and show their support for U.S. troops. The counter-protestors are calling themselves the Gathering of Eagles. 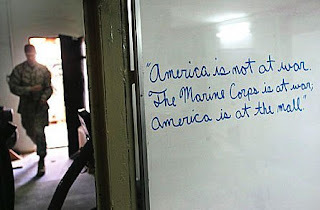 An unknown author wrote that description, but it describes how the veterans see their mission. They are angry that the Wall is being used as a jumping off point for a political protest and they are gathering to protect it from another storm of anti-war activists. "The anti-war/anti-America group cannot be allowed to use the Vietnam Memorial Wall as a back-drop to their anti-America venom and stain the hallowed ground that virtually cries out with blood at the thought of this proposed desecration ... it must not happen," said veteran Bud Gross. "… All Americans are invited to support our effort, which is intended as a defender of hallowed ground and intended as a non-violent competition between those that would sell out America and those of us who support freedom and keeping the fight with the enemy on distant shores." The group defending the Wall will be wearing armbands to identify themselves. 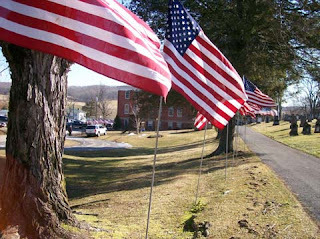 Those who are unable to stand with the defenders are being asked to wear armbands with small U.S. flags to show their own communities that they abhor the Fonda-Sheehan tactics. "We'll be there to act as a countervailing force against the Cindy Sheehan-Jane Fonda march from the Vietnam Memorial to the Pentagon," retired Navy Capt. Larry Bailey said. "We will protect the Vietnam Memorial. If they try to deface it, there will be some violence, I guarantee you." Bailey and thousands of his fellow Vietnam vets are worried that the anti-war protesters will damage the wall, just as they spray-painted the steps of the Capitol at their last march. The wall is sacred to the men and women who fought in that war. "It is our contact with our dead brothers -- those who lost their lives in the cause of their country," Bailey said. And so it is that Washington will see a Gathering of Eagles - Americans determined to stand up against leftist propagandists who denigrate U.S. troops and the mission for which they sometimes sacrifice their lives. Retired Col. Harry Riley organized the Gathering of Eagles. Organizers hope thousands will show up in Washington from as far away as Hawaii, and they won't only be Vietnam veterans. Families, friends and veterans of other wars, including Iraq, and soldiers still on active duty, will be there to defend the Wall. "When we say a gathering of eagles, that signifies people who support the American way," Bailey said. The leftist Web site MarchonPentagon.org: describes the anti-war demonstrators this way: "The March on the Pentagon has already attracted more than 1,500 endorsers, including prominent individuals and national and grassroots organizations. Students on college campuses and in high schools will be attending in large numbers. There will be a large turnout from the Muslim and Arab American community, which is organizing throughout the country." Retired Air Force Col. Smitty Harris, a former Vietnam POW, doesn't believe Fonda's protests carry the weight they once did. Harris says Fonda's actions at the march last month were "anti-American," just as they were in the 1970s, and won't have much effect on public opinion. "It was big news during the Vietnam era when they had these marches ... because people didn't have all the alternative ways of finding out what is true and what's not," he recently told Agape Press. "So I don't think it's going to have a big effect." In fact, he says, it could even be counterproductive. Today, Harris points out, Americans have talk radio and media outlets like the Fox News Channel to hear the voices of those who do not agree with Jane Fonda's point of view. I heard from an old friend today. She and I go back to the days when we worked together in Richmond in our early 20s, and we've stayed in touch all these years. She popped on my IM this afternoon to say her 19-year-old son, Brandon, joined the Marines. He left Richmond at the end of January and is currently at Parris Island, SC, in Marine boot camp. She was, understandably, a mom who missed her son and was weepy as she typed to me about him. I now have his address at boot camp ... a young man to keep in touch with and thank for his love of country. Brandon ... who knew? He's the age of my daughter, the youngest of three in his family. When he was young he was ... hmmm ... how shall I put it? Mischievous? A little rascal? That little mischievous boy grew up and decided he wanted to join the Marines. That little boy grew into a man. And may God bless his mom, my dear friend whom I've known all these years, and give her peace of mind. She is entering a proud stage of her life ... that of a Marine mom. 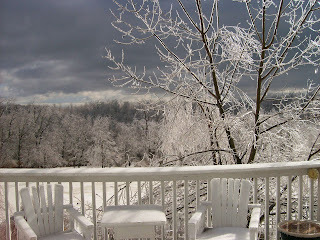 The remains of the ice storm that hit the Shenandoah Valley earlier this week are definitely sticking around. With daytime temperatures in the 20s and overnight temps in the single digits, there is still plenty of ice around. I love the winter woods, and yesterday offered the opportunity to slip away with my camera into the quiet and solitude and look at the beauty while also taking in the damage. The temp was mid-20s with little breeze. 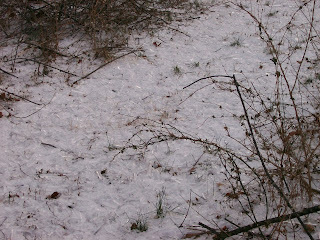 The trail was covered with ice shards that had fallen from limbs; the layer of ice on the ground was frozen solid enough to walk on top of it without breaking through. 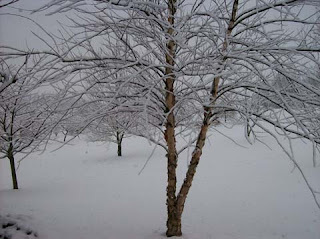 The icy white woods reminded me of a wonderland, a fairy tale forest, and occasonally I would hear an ice shard fall to the ground with a blunted tinkling sound as it hit and then skated along the ice. 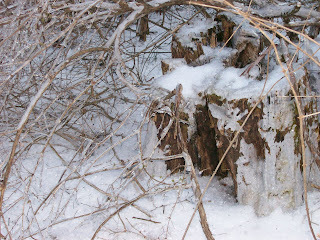 The weight of the ice had caused damage to trees, splitting away limbs of some and breaking out the tops in others ... and a lot of grapevine was on the ground where it had fallen out of the trees. My footing was a little treacherous in places but the soles of my hiking boots gripped the icy surface and safely carried me along the trail. 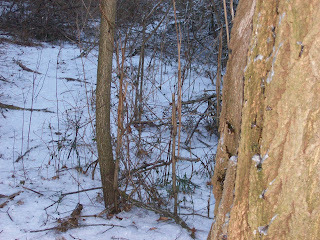 The quiet ... it was so nice to be alone in the silence of those icy woods on a cold winter day. Sad news was received this morning through the local military community that an Augusta County Marine was killed Tuesday in Iraq. Lance Cpl. Daniel Morris, 19, USMC, who graduated in 2005 from Wilson Memorial High School in Fishersville, was killed by an IED while on patrol in the Anbar Province near Haqlaniyah. Even though 9/11 occurred before he entered high school, he was determined to be a Marine and go to Iraq. He was prepared to fight for this country. In a sad twist of irony, he had wired Valentine roses to his mother on the day she received word of his death. Scheduled to return to Rockbridge County next month, he was killed by explosives at a roadside checkpoint. Daniel was part of the Wilson Memorial Marching Band, playing trumpet and leaving memorable impressions with faculty and students. He is the third Marine from Augusta County to be killed in Operation Iraqi Freedom. We have also lost Lance Cpl. Jason Redifer, 19, USMC, of Stuarts Draft who was killed January 31, 2005; and Lance Cpl. Daniel Bubb, 19, USMC, of Grottoes who was killed October 17, 2005. Funeral arrangements are incomplete but the family has said burial will be at New Providence Presbyterian Church. Our community will now wrap our arms around this family at this sad time. Please say a prayer and thank them for their sacrifice for our freedom. Update: More on Lance Cpl. Daniel Morris can be found at Staunton News Leader and Waynesboro News-Virginian. Update # 2: Information is also available from the Richmond Times-Dispatch and WDBJ TV-7. 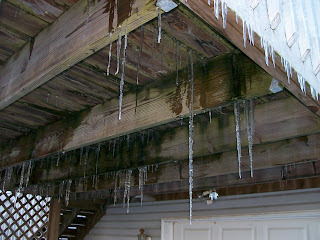 Update # 3: Staunton News Leader updated story 2/17/07. 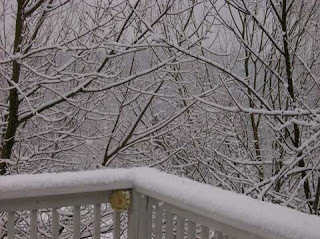 Update # 4: Waynesboro News-Virginian updated story 2/18/07. Badrose hits the nail on the head in her response thanking Virgil Goode for his statements on the House floor today during the debate on Iraq. Thanks to her for saying it so well. You've got to read it! Lib blogger gone off deep end? D.J. asks the question: "Has Waldo jumped the shark?" Waldo is after Virgil Goode again ... yawn. I am proud of my Congressman, Bob Goodlatte, who is supporting President Bush's request for additional troops to be sent to Iraq. He has actually been to the Middle East to speak with our Armed Forces. He has heard their belief in this mission and their support of their Commander-in-Chief. Congressman Goodlatte is scheduled to speak on the House floor this afternoon and I hope to see him when he appears. My TV is still tuned to C-SPAN and I am warmed by the passion voiced by those who feel we are correct in being in Iraq and that the President's plan to add troops is the correct thing to do. I was especially moved by Representative Todd Akin (R-Missouri) whose son is a Marine who served in Falusia. His son believes some things in life are worth defending ... and some convictions are worth defending with our lives. We are fighting terrorists who believe in blowing up innocent people to make a statement. Thank you, Representative Akin, for your son's service to this country. If you agree call Congressman Bob Goodlatte's office and thank him for supporting the President, our troops, and our Country! His D.C. office is (202) 225-5431. If you disagree with Senator John Warner and Representative Tom Davis, and if you are unhappy with their betrayal of President Bush, please contact them! Mister Speaker: In this debate, our first care should be for the safety and morale of the men and women serving in the American armed forces. Whatever the way forward, nothing said here should be heard by friend or foe as disrespect for the work and sacrifice of those who willingly fight our battles in a dangerous world. It took U.S. and Coalition forces less than three weeks to topple a brutal Iraqi regime that had held an iron grip on power for almost thirty years. Since then, they've battled a growing insurgency and rampant sectarian violence with professionalism and bravery. Of all the instruments of national power we could and should be discussing today -- diplomacy, economic policy, intelligence and warfare -- our military is the only one that has performed predictably, consistently, and well. Still, knowing what we know today, after almost four years of attempted nation-building on the shifting sands of Iraq, the plan to put twenty-one thousand more Americans in harm's way there has to be viewed with a cold-eyed skepticism born of that hard experience. Putting American troops between feuding Sunni and Shia in the middle of Baghdad is a mistake. This is the appropriate place for Iraqis, not Americans. The Iraq Study Group concluded that, "Sustained increases in U.S. troop levels would not solve the fundamental cause of violence in Iraq, which is the absence of national reconciliation." They quoted a U.S. general who said if the Iraqi government does not make political progress, "all the troops in the world will not provide security." I agree. Like many Members, Republicans and Democrats, I voted for the resolution authorizing President Bush to use force in Iraq, just as I supported President Clinton's decision to take military action against the former Yugoslavia. Four years ago, we were trying to persuade Saddam Hussein to comply with United Nations resolutions on disarmament and weapons inspections. Only a credible threat of force could possibly convince him it was finally in his interest to respect the lawful demands of the international community. I've got C-SPAN on in the background as I work at the computer ... and the debate continues between those who support the President's request for additional troops to Iraq, and those who don't get it. I'd like to be able to say it's the Republicans vs the Democrats but, unfortunately, that is no longer true. With turncoats like Republicans John Warner and Tom Davis coming out on the side of the Demcorats -- against our Republican President -- this debate has taken a sad, even more political turn. Rep. John Shimkus (R-Ilinois) read a long list of requests for support from real communications from real soldiers and veterans who say there is no substitute for victory ... we HAVE to win this war. MY Congressman, Bob Goodlatte, will speak shortly so I am hoping to see his speech. The only political spin and posturing in this entire debate is on the side of the Democrats. We were attacked on 9/11. We ALL agreed to go to war. Now some want to use their 20/20 hindsight to pull out, give up, and thumb their noses at the troops who have died to protect our safety and freedom. Tom Davis, in the words of Right-Wing Liberal, has thrown President Bush under the bus in the debate on Iraq. **sigh** Thanks, D.J., for saying it better than I here. WIN the WAR bumper stickers now available! 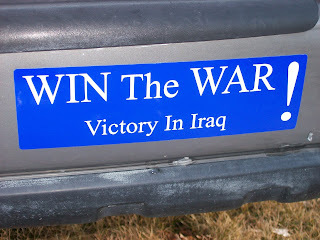 We now have WIN THE WAR bumper stickers available for $1 each. If you want it mailed to you add an addition $0.50. The wording says, "WIN THE WAR! Victory in Iraq" with blue background. If you'd like a bumper sticker respond to this post with your email address (I'll not publish) and I'll get in touch with you. Send a message! Support our Armed Forces! Win the War! Victory in Iraq. 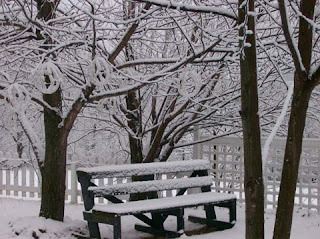 We weathered the storm and woke up to an icy wonderland this morning. 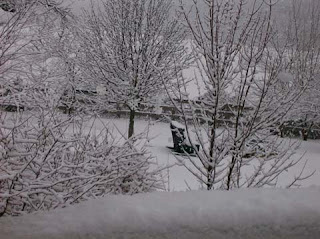 Sleet, snow, icy rain, and more sleet fell overnight in the Shenandoah Valley, causing widespread power outages including my house. We were prepared when the electricity went out in the wee hours of the morning, staying out for ten hours, and the woodstove kept us warm. It was an inconvenience but not a tragedy. Thanks to the workers at Shenandoah Valley Electric Co-Op for being there. It's a wintry mess out tonight. We've had ice, sleet, snow, more sleet ... it's white out there and icicles are growing longer on tree branches. 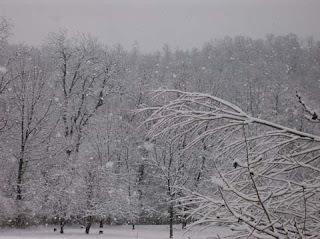 It looks like a Winter Wonderland ... but I wonder how long before the power lines go down and we're without electricity. Living in a mountain rural area, we are prepared for going without electricity. The hardest part would be having no computer for blogging or checking email or keeping up on the news. 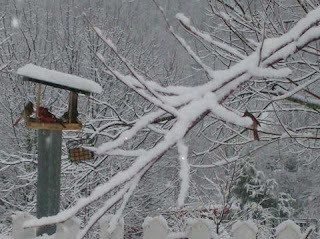 The forecast calls for the snow/sleet/ice to continue all night. Are we a Nation of spoiled brats? The Newsweek poll alleges that 67% of Americans are unhappy with the direction the country is headed and 69% of the country is unhappy with the performance of the president. In essence 2/3s of the citizenry just ain't happy and want a change. Could it be that 95.4% of these unhappy folks have a job? Perhaps you are one of the 70% of Americans who own a home. You may be upset with knowing that in the unfortunate case of a fire, a group of trained firefighters will appear in moments and use top notch equipment to extinguish the flames thus saving you, your family and your belongings. Neighborhoods where 90% of teenagers own cell phones and computers. I know, I know. What about the president who took us into war and has no plan to get us out? The president who has a measley 31% approval rating? 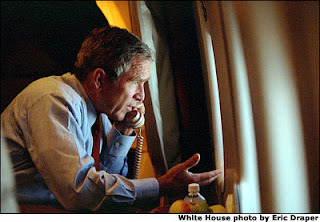 Is this the same president who guided the nation in the dark days after 9/11? The president that cut taxes to bring an economy out of recession? Could this be the same guy who has been called every name in the book for succeeding in keeping all the spoiled ungrateful brats safe from terrorist attacks? The commander in chief of an all-volunteer army that is out there defending you and me? Did you hear how bad the President is on the news or talk show? Did this news affect you so much, make you so unhappy you couldn't take a look around for yourself and see all the good things and be glad? ... is it because the "Media" told you he was failing to kiss your sorry ungrateful behind every day. Make no mistake about it. The troops in Iraq and Afghanistan have volunteered to serve, and in many cases may have died for your freedom. There is currently no draft in this country. They didn't have to go. They are able to refuse to go and end up with either a ''general'' discharge, an ''other than honorable'' discharge or, worst case scenario, a ''dishonorable'' discharge after a few days in the brig. So why then the flat-out discontentment in the minds of 69% of Americans? The media knows this and media outlets are for-profit corporations. They offer what sells, and when criticized, try to defend their actions by "justifying" them in one way or another. Just ask why they tried to allow a murderer like O.J. Simpson to write a book about how he didn't kill his wife, but if he did he would have done it this way ... insane! Stop buying the negativism you are fed everyday by the media. Shut off the TV, burn Newsweek, and use the New York Times for the bottom of your bird cage. Then start being grateful for all we have as a country. There is exponentially more good than bad. 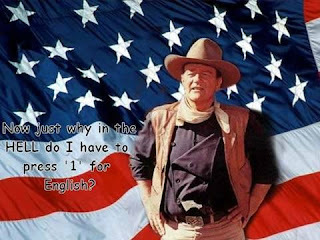 H/T - From an email from Charlie O.
do I have to press '1' for English?" I posted about the Bachelor Auction to benefit Sgt. Bunky Woods who was injured in Iraq. It was held last weekend and was a huge success. Here is a follow-up email from one of the organizers. It shows what can happen when everyone pulls together for our troops. God bless Bunky and his family ... thank you for your sacrifice for our freedoms. Remember ... supporting the troops includes here at home. The bachelor auction was a huge, huge success and far exceeded our wildest dreams. The outpouring of hope, support, generosity and heart felt prayers from our community was amazing and humbling. Some of the highlights were, Sgt. (P) Arthur "Bunky" Woods was able to attend and was smiling from ear to ear from 7 to 11. This was such a moral booster for him. He had a little taste of an "adult" beverage, while his nurse wasn't looking and told L.B., "Man, that tastes good." When Bunky was about to leave he gave a little talk, that was truly Bunky including his thanks, and a joke about Dusty getting his hair cut. A roar went up from the crowd of about 600 and he got a standing ovation leaving via the center isle. The festivities continued until around midnight. The preliminary total of the donations blew us away. The auction and associated activities raised in the neighborhood of $70,000. This wipes out the remaining cost of his van by far, and maybe we will use some of the proceeds to have his mother's house fitted with accessible doors and bath facilities as well. Fifty "Men with a Heart" were auctioned including yours truly who was sold for guess how much? $900 to an unsuspecting lady, ha. My brother sold for more than I did. I didn't bring as much as the silent auction horse, but did manage to bring more then the side of beef, which is somewhat understandable, since I was recently marinated, am nice and tender and aged to perfection. What a hoot. We will go to dinner at Wayside Inn, and a play at Wayside Theater. Bunky's Capt Jesser and Bunky's humvee 50 cal. gunner "Graves" were there to talk a little bit about Bunky's army experiences, and what Bunky meant to the Platoon. Capt. Jesser told everyone that when Sgt Woods was wounded in action, he lost the heart and soul of the platoon. He said that Bunky pushed his men and the platoon to the edge of the envelope and there was never a dull moment when Sgt Woods was around. Words cannot express our gratitude to everyone that helped and in particular Martha Buracker and the members of the auction committee. I can only pray that they all receive a wonderful reward from our Lord and Savior when they get to heaven. What a wonderful thing they did for Bunky. One of the reporters for the local paper interviewed me and asked about the how I felt about the outpouring of support from the community and I told him, "I grew up in Front Royal and Warren County, got a good education that prepared me for college and it was a beautiful place to grow up, so when Connie and I started a family we decided to raise our family here also." There is a lot to be said for coming from a small close community. Bunky hasn't regained any additional mobility yet but he is feeling better each day. He made it back to Richmond around 2 AM and snoozed most of the day Sunday. Milk & bread? Heck no ... I need chocolate! I left my class yesterday afternoon at 4:00 and headed for the pharmacy to pick up medicine for this cold that refuses to let go of me. Since the weather forecast was for inclement weather in the area, I knew the grocery stores would be backed up ... but I was surprised to turn into Rite Aid and see a packed parking lot full of vehicles. Were shoppers after milk and bread? They were after ... Valentines. Everyone was clumped around the chocolates, stuffed animals, and cards on the Valentine aisles. Since Valentine's Day was only two days away, and with ice and snow in the forecast, I suppose they were afraid they wouldn't be able to get out to pick up goodies for their significant others. I took a cue from them ... and bought Valentine treats for my family and friends. Didn't need the milk and bread ... but needed the chocolates! I'm ready for Valentine's Day. Your Taxes & Pet Projects: So what constitutes "necessary"? Whitney Duff has been working tirelessly traveling around Virginia educating taxpayers about the wasteful ways their tax money has been spent on pet projects that, while many are nice to have, are not necessary in this time when there have been proposals to raise taxes again. In her guest column that appeared this week in the Richmond Times-Dispatch, she expounds on that theme. Pet Projects: So, What Constitutes 'Necessary'? Virginia's Constitution stipulates that "No other or greater amount of tax or revenues shall, at any time, be levied than may be required for the necessary expenses of the government, or to pay the indebtedness of the Commonwealth." Looking at the growth of the state's budget from $35 billion just over a decade ago to over $74 billion today, one has to wonder if anyone knows exactly what makes up the "necessary expenses of the government." Perhaps no one really cares. Government spends the money it collects, without any obligation to prove the spending is "necessary," a term Merriam-Webster defines as "absolutely needed." The exploding growth of the budget and the continued spending of hard-earned tax dollars to fund hundreds of millions of dollars in pet projects, make it apparent that some Virginia lawmakers must define "necessary" a bit more loosely. Their generous laundry list of requests for non-state agencies which, by definition, are not core services of government, hence their non-governmental status -- may leave one scratching one's head asking just how these pet projects qualify as "necessary." The Dismal Swamp Canal Trail, Barns of Rose Hill, Historic Pocahontas, Inc., Roanoke Symphony Orchestra, Loudoun Archaeological Foundation, Louisa Historical Society, Newsome House Museum -- these are just a few of the projects lawmakers have sought to fund with our tax dollars. Then there's the Virginia Museum of Transportation (ironic, perhaps in light of the ongoing transportation debate, but necessary?). WHILE EACH of these projects likely does have some merit and a handful of faithful supporters, do any of them really meet the definition of "necessary expenses of the government"? Supporters will argue about their benefits for tourism or job creation -- and those are certainly laudable additions to our Commonwealth and communities -- but at what cost: $2 million for the Arlington Signature Theatre? $1.75 million for Wolf Trap? $5 million for the Western Virginia Foundation for the Arts and Sciences? Can our tax dollars subsidize every well-intentioned idea? Sen. Mark Obenshain put it well recently, noting these projects "are worthy of private support from private donors, but not from taxpayer pockets." The English philosopher John Locke and others rightly observed that the purpose of government must be to provide for the common security and for those projects individuals alone cannot fund. Surely, transportation problems that affect millions of the Commonwealth's citizens every day deserve more of legislators' attention and should win against parochial pet projects in the competition for taxpayers' hard-earned dollars. Transportation is the issue that kept lawmakers in an extended session last year and remains the key topic in this year's session. Congestion and safety issues on Virginia's roadways, especially in the high-growth areas of Northern Virginia and Hampton Roads, do deserve lawmakers' attention and commitment to substantive and meaningful solutions. Yet, some of those same lawmakers who seek to once again raise our taxes in the name of transportation solutions are the same ones making hundreds of millions of dollars' worth of requests for pork-barrel earmarks from the general fund. THIS YEAR alone, state senators requested a total of $113 million in general-fund dollars for pet projects, while delegates requested another $135.1 million. It is ironic that many of these legislators, especially in the Senate, are now criticizing those who would instead choose to invest general-fund revenue in projects to address statewide transportation needs. Governing well requires establishing priorities, particularly when it comes to spending tax dollars. The bedrock principle of budgeting is the necessity to make tough choices about how dollars -- our tax dollars in this case -- would be most effectively and efficiently spent. "Necessary expenses of the government" is not a guideline; it's a constitutional requirement. Virginia's taxpayers expect their representatives to respect the money they are sending to Richmond. Americans for Prosperity is committed to making sure our lawmakers see the light and work to restore taxpayers' trust in their government by spending our tax dollars more as they would spend their own money. Whitney Duff is the director of the Virginia chapter of Americans for Prosperity. "Another trip around the sun...."
"Oh where, oh where has my iPod gone...."
Blogs of the future: Alliances? Snow Day in the Valley! 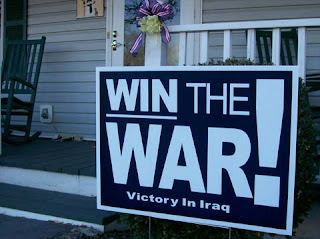 WIN THE WAR signs are a hit!